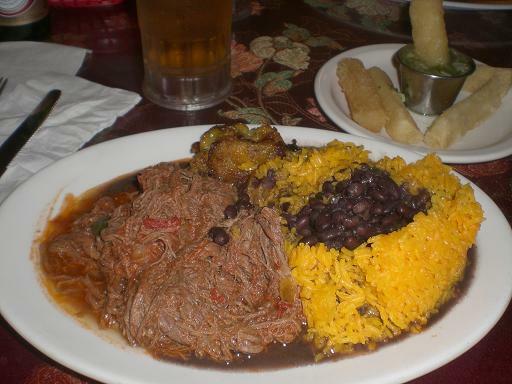 Cuban cuisine combines influences from African cuisine, Caribbean cuisine, and Spanish cuisine. It should be noted that are significant dishes between the cuisine in the East and West of the island. In eastern Cuba, criollo (creole) cuisine tends to predominate, and you can also find many foods influenced by the Puerto Rican cuisine and the cuisine of the Dominican Republic (although often with particular Cuban twists). In the West of Cuba, the influences of European and Spanish cuisine are more apparent, and there are also some dishes which are influenced by Chinese cuisine which are popular in the capital, Havana. Arroz con pollo - Chicken with yellow rice. Boliche - Beef eye round roast stuffed with chorizo, all in a tomato sauce. Croquetas - Croquettes eaten as a finger food, especially in Havana. They contain cheese or ground beef, chicken, ham or fish, in a white sauce, and are then coated in bread crumbs and deep-fried. Fabada Asturiana - A rich bean stew with white beans, black blood sausage (morcilla), spicy sausage (chorizo) and pork shoulder (lacón). It is flavored with saffron (azafrán) and seasonings, and is inspired by the Spanish dish of the same name. Huevos a la habanera - Fried eggs on rice with plantains. Mofongo - This dish tends to be eaten in eastern Cuba (as well as Puerto Rico). In Cuba it is also known as "Fou-fou". 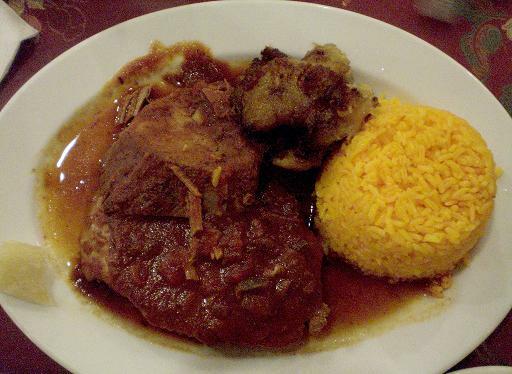 The dish consists of mashed plantains which are stuffed with chicken, pork or seafood. Papas rellenas - Potato balls filled with ground beef, fried. Picadillo - Ground beef with tomatoes, olives and capers. It is usually served with black beans and rice. Platillo Moros y Cristianos - The Cuban version of rice and beans, made from black beans and white rice. The name is inspired by, and refers to the Reconquista of Spain (the Christian reconquest of Spain from Muslims), the Christians being referred to as "Cristianos" and represented by the rice, the muslims (Moors) being refered to as "Moros", being represented by the beans. Ropa vieja - This dish is originally from the Canary Islands in Spain. Literally translated from Spanish, its name means "old clothes", although why it is called this is unknown. The dish consists of shredded flank steak in a tomato sauce, and is typically served with black beans, fried cassava, plantains and yellow rice. Tortilla de papa - Egg and potato omelette. Tostones - Sliced unripe plantains, fried to make them crispy like potato chips.